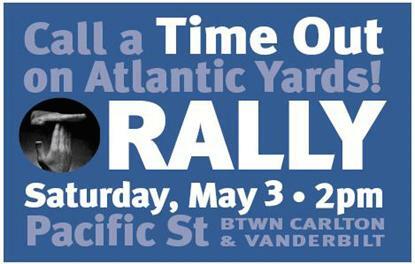 A major community rally will be held Saturday, May 3, 2pm at 752 Pacific Street. The Council of Brooklyn Neighborhoods, Brooklyn Speaks, and Develop Don’t Destroy Brooklyn will join with community leaders and elected officials in calling for a freeze on all Atlantic Yards activities. The three sponsoring organizations represent thousands of New Yorkers that have had differing perspectives on issues raised by the Atlantic Yards proposal, but all agree that the current state of affairs is intolerable. The following elected officials have confirmed attendance: NYS Senator Velmanette Montgomery, NYS Assemblywoman Joan Millman, NYS Assemblyman Hakeem Jeffries, NYC Councilwoman Letitia James, NYC Councilman Bill Deblasio, NYC Councilman David Yassky, NYC Councilman Tony Avella. DDDB has always maintained that Atlantic Yards is not a feasible project. Recent developments in the financial markets and statements by the developer have made that certain, and call the entire project and its purported public benefits into question. The only thing currently with a timeline is the arena and its luxury skyboxes and acres of demolished vacant lots. Meanwhile our neighborhoods are being blighted by unnecessary demolitions for a project that is now a big unknown. DDDBâ€™s position remains the same as it has from the beginningâ€”the project is bad for many reasons from process to finance to design, and we oppose it. The project should be scrapped; itâ€™s time for a new plan to develop the rail yards in a democratic, fair and responsible way with genuine community participation. > No More Eminent Domain! > No More Changes to Infrastructure! Those of you who are interesting in making your outrage known, here’s how you can get there!